Today is the Feast of Saint Louis IX, King of France, patron of the City of Saint Louis and principal patron of the Archdiocese. 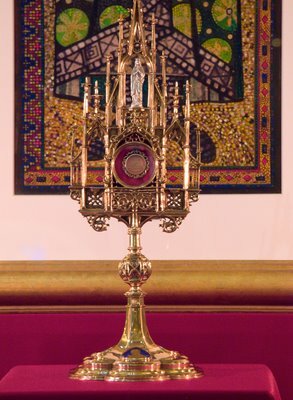 Icon and relic of Saint Louis. A view showing the Archbishop's cathedra. Note the mosaics of crowns and fleurs-de-lis, symbols of the king.